scattered; distributed over a considerable area. disseminated intravascular coagulation (DIC) a bleeding disorder characterized by abnormal reduction in the elements involved in blood clotting due to their use in widespread intravascular clotting. It may be a secondary complication of any of numerous obstetrical, surgical, infectious, hemolytic, and neoplastic disorders, all of which activate in some way the intrinsic coagulation sequence. Paradoxically, the intravascular clotting ultimately produces hemorrhage because of rapid consumption of fibrinogen, platelets, prothrombin, and coagulation factors V, VIII, and X. Because of this pathology, the condition is sometimes called defibrination syndrome or consumption coagulopathy. There may be signs and symptoms related to tissue hypoxia and infarction caused by the many microthrombi, but DIC is more often seen as an acute or chronic hemorrhagic disorder related to excessive and diffuse depletion of the elements needed for hemostasis. DIC should be suspected in any patient who has an unexplained tendency toward bleeding, and is suffering from one of the following types of clinical conditions: (1) those that introduce coagulation-promoting factors into the circulation, as in abruptio placentae, retained dead fetus, amniotic fluid embolism, metastatic carcinoma of the pancreas, lung, stomach, or prostate, and acute promyelocytic leukemia; (2) those that lead to stagnant blood flow, as in hypotension and polycythemia; (3) those accompanied by widespread endothelial injury, as in severe burns, trauma, heat stroke, and surgery, particularly surgery involving extracorporeal circulation; (4) various types of infections and bacteremias; and (5) snake bite and fat embolism. The tendency toward excessive bleeding can appear suddenly and, with little warning, rapidly progress to severe or even fatal hemorrhage. Signs of DIC include continued bleeding from a venipuncture site, occult and internal bleeding, and, in some cases, profuse bleeding from all orifices. Other less obvious and more easily missed signs are generalized sweating, cold and mottled fingers and toes (due to capillary thrombi and hypoxia), and petechiae. The diagnosis of DIC is confirmed by laboratory tests that show prolonged thrombin time, prothrombin time, and partial thromboplastin time; depressed platelet count and fibrinogen count; elevated fibrin split products (FSP); and a strongly positive protamine sulfate test. Assays for coagulation factors are commonly done to diagnose DIC; if the condition is present, the levels of these factors are reduced. Extreme care must be taken to prevent complications related to bleeding. Injections should be avoided. Venipunctures should be limited whenever possible. Treatment of DIC consists of replacement of the inadequate blood products and correction, when possible, of the underlying cause. When the primary disease cannot be treated, intravenous injections of heparin may inhibit the clotting process and raise the level of the depleted clotting factors. However, heparin therapy remains controversial as it can itself cause bleeding. a hemorrhagic syndrome that occurs following the uncontrolled activation of clotting factors and fibrinolytic enzymes throughout small blood vessels; fibrin is deposited, platelets and clotting factors are consumed, and fibrin degradation products inhibit fibrin polymerization, resulting in tissue necrosis and bleeding. See also: consumption coagulopathy, fibrinogen-fibrin conversion syndrome. a grave coagulopathy resulting from the activation of clotting and anticlotting processes in response to disease or injury, such as septicemia, acute shock, poisonous snakebites, neoplasms, obstetric emergencies, severe trauma, extensive surgery, and hemorrhage. The primary disorder initiates generalized intravascular clotting, which in turn activates fibrinolytic mechanisms. As a result, the initial hypercoagulability is succeeded by a deficiency in clotting factors with coagulopathy and hemorrhaging. Also called consumption coagulopathy, defibrination syndrome. observations Purpura on the lower extremities and abdomen, reflecting fibrin deposits in capillaries, is a common first sign of DIC. Hemorrhagic bullae, cyanosis of the extremities, and focal gangrene in the skin and mucous membranes may follow. Hemorrhages from incisions or catheter or injection sites, GI bleeding, hematuria, pulmonary edema, pulmonary embolism, progressive hypotension, tachycardia, absence of peripheral pulses, restlessness, convulsions, or coma may occur. Laboratory studies generally show a marked deficiency of blood platelets, low levels of fibrinogen and other clotting factors, prolonged prothrombin and partial thromboplastin times, and abnormal erythrocyte morphological characteristics. nursing considerations The management of acute and chronic forms of disseminated intravascular coagulation (DIC) should primarily be directed at treatment of the underlying disorder. The care of a patient with life-threatening DIC requires careful monitoring, observation for evidence of bleeding, extremely gentle handling, maintenance of a safe environment, and emotional support. A serious disorder of the blood clotting mechanism in which extensive clotting occurs within the blood vessels from the sustained and excessive generation of thrombin, followed by a strong activation of the clot fibrin breakdown system (fibrinolysis) leading to a severe bleeding tendency. DIC can be caused by severe sepsis, extensive trauma, mismatched blood transfusion, brain injury, extensive burns, snake bite and liver disease. Current best treatment in sepsis cases involves the use of a recombinant form of human activated protein C.
A serious medical condition that develops when the normal balance between bleeding and clotting is disturbed. Excessive bleeding and clotting injures body organs, and causes anemia or death. Disseminated intravascular coagulation (DIC) is a life-threatening hemostatic disarray in which bleeding and clotting occur simultaneously. The International Society on Thrombosis and Haemostasis defines DIC as the following: DIC is an acquired syndrome characterized by the intravascular activation of coagulation with loss of localization arising from different causes. It can originate from and cause damage to the microvasculature, which, if severe, can produce organ dysfunction. DIC is also called consumptive coagulopathy and defibrination syndrome. The pathophysiology involves an overactivation of the clotting mechanisms with both enhanced fibrin production leading to small clots and fibrinolysis leading to enhanced bleeding. As its name implies, tiny clots accumulate in the microcirculation (capillaries) throughout the body, depleting the blood supply of its clotting factors. These microemboli interfere with blood flow and lead to ischemia and organ damage. As the clots begin to lyse, fibrin degradation products (FDPs), which have an anticoagulant property of their own, are released. The FDPs, along with decreased levels of clotting factors in the bloodstream, lead to massive bleeding internally from the brain, kidneys, adrenals, heart, and other organs or from any wounds and old puncture sites. Because DIC is somewhat difficult to diagnose, the following definition may be helpful in understanding the disorder: It is a systemic thrombohemorrhagic coagulation disorder associated with well-defined clinical situations (see Causes) and laboratory evidence of coagulant activation, fibrinolytic activation, inhibitor consumption, and biochemical evidence of end-organ damage. Morbidity and mortality depend on the underlying disease that initiates DIC and the severity of coagulopathy. In people who are severely injured, the presence of DIC generally doubles the mortality rate. DIC always occurs in response to another type of disease or trauma. DIC is usually an acute syndrome, although it may be chronic in patients with cancer or more long-standing conditions. Sepsis is the most common cause of DIC, with a prevalence of 7% to 50%. Conditions that may precede its development are cardiac and peripheral vascular disorders, transfusion reactions, sepsis, septic shock, and severe infection, viremias, organ destruction such as liver and pancreatic disease, transplant rejection, leukemia, metastatic cancer, burn injuries, and obstetric complications (abruptio placentae, pregnancy-induced hypertension, saline abortion, amniotic fluid embolism, or a retained dead fetus). It is not known how these disorders trigger the onset of DIC, but they activate the intrinsic or extrinsic pathway of the coagulation cascade. Some experts suggest that these disorders cause a foreign protein to be released into the circulation and that the vascular endothelium is injured. Others note that one of the following clinical situations needs to be present in order for DIC to occur: arterial hypotension, hypoxemia, acidemia, and stasis of capillary blood flow. Alterations in production of components of clotting and thrombolysis (e.g., factor V deficiency, protein C deficiencies) are heritable and can contribute to DIC. Protein C deficiency is usually inherited as an autosomal dominant trait and is associated with an increased risk of venous thrombosis. DIC can occur any time during the life span. Women of childbearing age who develop pregnancy-induced hypertension and the HELLP syndrome (hemolysis, elevated liver, low platelet) are potential candidates to develop DIC. Other high-risk patients are those with neoplasms (often the elderly), sepsis, or traumatic injuries (often young adult males) such as burns and crush injuries. No racial or ethnic considerations are known to be associated with DIC. DIC is recognized globally, but no data on prevalence are available. Obtain a history specific to the precipitating disorder. If the patient is alert, ask if he or she has any chest, joint, back, or muscle pain, which is often severe in DIC. Recognize that the patient may be confused and disoriented as a result of blood loss or the underlying condition, so that historic information may not be accurate. The most common symptoms are blood loss from wounds, gums and gastrointestinal track, bleeding into the skin, hematuria, and/or epistaxis. Assess the patient’s skin for any petechiae, ecchymoses, hematoma formation, epistaxis, bleeding from wounds, vaginal bleeding in the labor or postpartum patient, hematuria, conjunctival hemorrhage, and hemoptysis. Bruising can occur anywhere in the body. In addition, assess the patient’s skin for bleeding or oozing at any intravenous, intramuscular, or epidural sites. Assess the patient’s vital signs. If the patient is hypovolemic, expect to find a decreased blood pressure, rapid thready pulse, and increased respiratory rate. The patient may be restless, agitated, and confused. Measure the abdominal girth to obtain a baseline for further assessments. Note the presence of oliguria and compare current urine output with previous readings. Patients may feel a sense of “impending doom,” and the family is probably fearful of losing a loved one. This situation is intensified if the patient is a young pregnant or newly delivered mother. Note that increased blood or bleeding is associated with death and dying for many people; the visible presence of multiple bleeding or oozing sites and the need for multiple transfusions may also be a source of anxiety. Other Tests: INR (International Normalized Ratio): Standardizes the PT ratio by allowing laboratories to compare values with an international standard provided by the World Health Organization. Formula is patient’s PT in seconds/mean normal PT in seconds. In DIC, INR is elevated from a normal value of 1.3 to 1.6. Therapeutic range for INR is 2 to 3 for people on warfarin. Factors: Decrease in factors II, V, and VIII; prothrombin fragments 1 and 2 and fibrinopeptide A (through enzyme-linked immunosorbent assay). A DIC risk assessment has been developed by the International Society on Thrombosis and Haemostasis. The scale involves calculating a score based on the laboratory coagulation tests: Platelet count, D-dimer, FDP, fibrinogen, PT, and APTT. The scoring is as follows: Platelet count: > 100 = 0 points, < 100 = 1 point, < 50 = 2 points; Elevated fibrin marker: No elevation = 0 points, moderate increase = 2 points, strong increase = 3 points; Prolonged PT: < 3 seconds = 0 points, > 3 to < 6 = 1 point, > 6 = 2 points; Fibrinogen level: > 1 g/L = 0 points, < 1 = 1 point. A score greater than or equal to 5 is compatible with overt DIC, and a score less than 5 suggests nonovert DIC. The patient should also be assessed to determine if an underlying disorder such as trauma or sepsis exists. Because DIC always occurs in association with another condition, medical treatment focuses on correcting the underlying disorder. In addition, the physician seeks to return the patient to normal hemostasis. 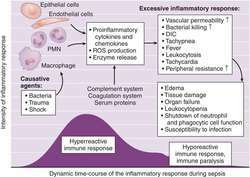 Active bleeding is managed by blood component therapy. To ascertain the success of cell and factor replacement, constant surveillance of laboratory values is critical to determine which blood components should be administered. In general, packed red blood cells are used to improve oxygen delivery by increasing the hemoglobin content of the blood. Fresh-frozen plasma replaces many of the clotting factors, whereas cryoprecipitate is the best source of fibrinogen and factors VIII and XIII. Platelet transfusion is used when the platelet count falls below 100,000/mm3. If the patient is critically ill, the physician may place a pulmonary artery catheter (PAC) to monitor the patient’s hemodynamic status. Note that increased bleeding tendencies make the insertion time of central access devices important; central catheters such as a PAC should be placed when the coagulation profile has been corrected with blood component therapy to prevent dangerous bleeding into the cardiopulmonary system. If the patient is pregnant, fetal monitoring is continuous; notify the physician of late decelerations, decreased variability, or bradycardia. Keep the patient on her left side and administer oxygen by mask at a rate of 10 L per minute. Turn and reposition the patient frequently and gently to avoid further bleeding. The goal is to keep the fetus oxygenated while stabilizing the mother so that a cesarean section can be done. When a bleeding disorder occurs in addition to another condition, the patient’s and significant others’ coping skills and resiliency may be at a low point. During this time, the patient and significant others need accurate information, honest reports about the patient’s condition and prognosis, and an attentive nurse to listen to their concerns. Provide emotional support and educate them as to the interventions and expected outcomes. Help them understand the severity of the condition and the treatments; do not present false hopes. Offer to call a chaplain or religious counselor if needed. The patient is usually maintained on complete bedrest. Pad the side rails to help prevent injury. Reposition the patient every 2 hours and provide skin care. Gently touch the skin when repositioning and bathing; vigorous rubbing could dislodge a clot and initiate fresh bleeding. Crusted blood can be gently cleaned with a mixture of hydrogen peroxide and water and cotton. If the patient has experienced hemarthrosis (bleeding into the joints), the condition is very painful. Manipulate any joint gently and with great care to minimize discomfort and to limit further bleeding. Inform all healthcare personnel coming in contact with the patient about her or his bleeding tendency. Place notations on the chart cover and at the head of the bed to alert caregivers to the patient’s bleeding condition. Keep all venipunctures to a minimum and hold pressure to any puncture site for at least 10 minutes. Iba, T., Saito, D., Wada, H., & Asakura, H. (2012). Efficacy and bleeding risk of antithrombin supplementation in septic disseminated intravascular coagulation: A prospective multicenter survey. Thrombosis Research, 130(3), e129–e133. International guidelines caution against the use of high-dose antithrombin therapy for severe sepsis due to increased bleeding risks; however, supplementation of antithrombin may result in improved outcomes for septic patients who are also experiencing DIC. A review of 729 septic patients in DIC who were treated with supplemental antithrombin revealed an overall total of 42 (6.52%) bleeding events, 11 of which were severe. There was no statistically significant difference in bleeding events between patients who were treated with 3,000 IU/day (79 patients) compared to those treated with 1,500 IU/day (650 patients). However, DIC resolved by the seventh day in a greater proportion of patients treated with higher doses of 3,000 IU/day (69.6%) when compared to those treated with lower doses of 1,500 IU/day (55.4%) (p < 0.05). The survival rate was also significantly increased among patients treated with 3,000 IU/day (74.7%) compared to those treated with 1,500 IU/day (65.2%). A dose of 3,000 IU/day nearly doubled the odds of survival at 28 days (95% CI, 1.079 to 3.388; p = 0.026). Teach the patient and significant others about the disorder and that it is unlikely that it will recur in the future. If the patient required blood component therapy, provide information about the risk of hepatitis or HIV transmission. Check with the patient’s obstetrician to determine if the patient can nurse the infant and resume unprotected sexual relations. Provide discharge instructions related to the patient’s primary diagnosis. Teach the patient to notify the physician of any uncontrollable bleeding or syncope. A hemorrhagic syndrome that occurs following the uncontrolled activation of clotting factors and fibrinolytic enzymes throughout small blood vessels. n a grave coagulopathy resulting from the overstimulation of clotting and anticlotting processes in response to disease or injury, such as septicemia, acute hypotension, poisonous snake bites, neoplasms, and severe trauma. within a vessel or vessels. that part of the total body fluid that is within the vascular system. the space occupied by the blood. Increased plasma soluble fibrin monomer levels in patients with disseminated intravascular coagulation. To assess the fibrinolytic activity (using D-dimer assay) in clinically diagnosed cases of Acute disseminated intravascular coagulation. Correlation between plasma activity of ADAMTS-13 and coagulopathy, and prognosis in disseminated intravascular coagulation. One hour later, during the manipulations of the ileal conduit but before closure, profuse bleeding occurred suggesting acute disseminated intravascular coagulation (DIC). In addition, D-dimer has been shown to be a reliable indicator of coagulation activation in disseminated intravascular coagulation (5) and malignancy (6). Antifibrinolytics were not given as disseminated intravascular coagulation from sepsis was suspected for which this group of drugs are generally contraindicated (14,15). Less frequently, the chief manifestation is seizure, or hemorrhage with disseminated intravascular coagulation. Other clinical problems that may cause disseminated intravascular coagulation (DIC) should also be known. Coagulation studies suggested disseminated intravascular coagulation and acute renal failure (serum creatinine 143 micromoles/L). a private biopharmaceutical company dedicated to bringing best-in-class critical care therapeutics to patients, today announced the completion of patient enrollment in its Phase 2b study of ART-123 (Recomodulin[R] - recombinant human thrombomodulin) in sepsis patients with disseminated intravascular coagulation (DIC). Keep in mind that preeclampsia is an ischemic disease and the disseminated intravascular coagulation of preeclampsia usually resolves within 24 hours of delivery, while some of the conditions that mimic it are metabolic and many continue long after, he advised.